Earlier in 2000, Health Care Now decided they wanted to learn more about free care policies at District of Columbia acute care hospitals. They wanted to determine if hospitals were complying with existing government free care regulations and how easy it would be for an uninsured person to obtain free care. Relying on a contract with The Access Project to provide consulting services, Health Care Now received support for the data gathering and analyses used in this report. This monitoring project itself was designed and prepared by Community Catalyst for The Access Project. Using data from the monitoring project, Health Care Now developed the report's recommendations. Health Care Now is a consumer-based healthcare coalition whose mission is to educate, organize, and mobilize the people of the District of Columbia to create a high quality and affordable healthcare system for all people in the District. The coalition believes that access to health care is a fundamental human right, and it strives to build the knowledge and capacity of the community by empowering consumers to work for a fair, just and equitable healthcare system that includes consumers in the decision making process. To achieve these goals, people from all the diverse communities of the District must come together and organize a movement that will advocate for health care for all. Health Care Now includes consumers of all races, ethnic groups and economic backgrounds. Health Care Now is a project of the Community Health Advocacy Initiative of the Center for Community Change. Founded in 1968, the Center for Community Change is a national, non-profit organization that provides technical assistance to low income community-based organizations. The Center's objective is to help poor people improve their communities and change policies and institutions that affect their lives by developing their own strong organizations. Located in Boston, The Access Project is a national initiative supported by The Robert Wood Johnson Foundation in partnership with Brandeis University's Heller Graduate School. The mission of The Access Project is to improve the health of our nation by assisting communities in developing and sustaining efforts that improve healthcare access and promote universal coverage with a focus on people who are without health insurance. Community Catalyst is a national nonprofit advocacy organization that builds consumer and community participation in the shaping of our health system to ensure quality, affordable health care for all. The primary authors of this report are Betsy Stoll and Susan T. Sherry of Community Catalyst. Jacquie Anderson of Community Catalyst conducted the monitoring research and contributed to the report. Howard Croft, Arturo Griffith, Daniel Berry and Julia Burgess from the Center for Community Change assisted in the research project. Free care-sometimes called charity care-is a critical piece of the health care safety net. Free care is care provided by a hospital for which the hospital does not expect to be paid. Hospitals provide free care to people who show they cannot afford to pay for their care. In this way it is different from what hospitals call "bad debt," which is money owed to a hospital for which the hospital does expect to be paid. For people who have no health coverage and few resources, free care is often the only way they can get necessary medical treatment. In a community like the District of Columbia, which has approximately 80,000 residents who have no health insurance, free care is a critical piece of the health care safety net. A hospital's obligation to provide free care stems from multiple sources. For those hospitals that are non-profit institutions, the obligation arises from the fact that they are exempt from local, state and federal taxation, and that they receive charitable contributions and volunteer services. In return for this exemption, non-profit hospitals are expected to use their assets to provide services and benefits, including a certain amount of free care, to the communities that support them. A second base for the free care obligation relates to the nature of health care. Health care is an essential core service that is critical to the well-being of individuals and communities. Institutional providers of those services, regardless of whether they are for-profit or non-profit, have a minimum social responsibility to provide some measure of free care. Statutory or regulatory requirements that address the free care obligation of each hospital are the third base of support. In the District of Columbia, any hospital that has ever had a Certificate of Need issued to it by the Department of Health is required to provide what are called "uncompensated services" in an amount equal to three percent of its annual operating costs. Additionally, every hospital is required to advertise the availability of uncompensated services, both in the newspaper and on-site at the facility, and to have a written uncompensated services policy. In the spring of 2000, Health Care Now conducted a survey of the ten local acute care hospitals to determine whether the availability of uncompensated services was advertised, and how easy it was for individuals to access those services. The survey consisted of calls to the hospital's general information number and finance department, and on-site visits. At all ten hospitals surveyed, there were inconsistent responses from staff as to whether free care was available. Of the ten hospitals surveyed, only one stated that it had a written policy regarding free care, and only three were able to produce free care applications. Of the ten hospitals surveyed, only two had visible signs or notices publicizing the availability of free care. Although these findings do not mean the hospitals are not providing uncompensated services as required, the researchers' difficulty in obtaining clear and consistent information about the availability of free care raises the question as to whether there is a widespread lack of compliance. Even if hospitals are providing uncompensated services as required, the survey indicates that they are not in compliance with the notice requirements. For people with urgent-or even routine-medical needs who don't have the resources to pay for them, this lack of information can make a bad situation even worse. First, hospitals should comply with the existing regulations, and the Department of Health must be aggressive in the monitoring and enforcement of compliance. Second, hospital eligibility for public monies such as Medicaid "disproportionate share hospital" funds and other enhanced Medicaid payments should be conditioned on the hospital's free care policies and performance, including the adoption of free care policies that meet more generous income standards. Third, the system for providing uncompensated services should be strengthened and expanded. Specifically, we propose that legislation be enacted which changes the system for financing free care. To ensure that the burden is spread equitably among hospitals, a free care pool should be created for the benefit of hospitals and safety net community-based clinics that would be funded through a surcharge on the hospital bills of most third-party payors. We want it to reinforce for the leadership and community of the District of Columbia the critical nature of free care and the need to ensure that it is readily accessible. We want it to mobilize that leadership and community to secure compliance with existing free care requirements. We want to challenge that leadership and community to take on this issue and champion reforms of the free care system that truly mend the District's tattered healthcare safety net. Free care -- or charity care, as it is sometimes called -- is medical treatment provided by a hospital at no cost or at a reduced cost. For people who are uninsured or have only limited coverage, free care may represent the only avenue to necessary medical treatment. It is an essential safety net for many working individuals and families who are not eligible for coverage through a government program like Medicaid or Medicare, and who do not get health insurance through their employers. The availability of free care is particularly important in communities like the District of Columbia ("the District") which have relatively high percentages of uninsured and which also have shortages of primary care providers in certain medically needy neighborhoods. If they need medical care, people often have no place to turn but a hospital emergency room or outpatient department. The unavailability of free care can have a catastrophic impact on individuals and families. In some cases, low-income people may avoid seeking necessary care if they think they will be billed for it. The untreated medical condition can result in serious functional limitations or even death. If the person goes ahead and receives care for which he or she can't pay, the hospital often will start collection proceedings. Ultimately, the individual's credit rating can be ruined or there may be no option but to file bankruptcy, either of which can affect access to other basic human needs like housing. To be eligible for full or partial free care, hospitals generally require that a person's income be at or below a certain level. If a person is eligible and approved for free care by the hospital, the hospital does not expect to be paid. Free care is different from what hospitals call "bad debt." Bad debt is money that is owed for hospital services for which the hospital does expect to be paid. The distinction is important. Bad debt is a cost of doing business in any industry. Bad debt is just as likely to result from unpaid insurance claims or the unpaid co-insurance amount for a higher-income individual as it is from a lower-income person who can't afford to pay for care. The obligation of a hospital to provide free care arises from several different, but equally important, sources. The first source is applicable to those hospitals that are non-profit institutions, as are the majority of hospitals in the District. Non-profit hospitals are exempt from local, state and federal taxation. In return for this exemption, the hospitals are expected to use their assets to provide services and benefits to the community in which they are located. In effect the hospitals "belong" to the public. Historically the community benefits and services provided by non-profit hospitals have included the provision of free care to individuals who do not have the means to pay some or all of their hospital expenses. A requirement that the hospital publish annual notice of its uncompensated services obligation and how it intends to meet it. A requirement that the hospital post prominent signs that it is required to provide free care services, in English and Spanish at a minimum. A requirement that the hospital provide written notice of the availability of uncompensated services and the eligibility requirements to each person who requests those services. A requirement that determinations about individual eligibility for uncompensated services be made in writing. A requirement that the hospital submit an annual report to the Department of Health documenting its compliance with the regulations governing uncompensated services. Health Care Now decided to conduct a survey to see (1) whether it was easy for uninsured individuals and social service agency staff to find out about the availability of free care, (2) whether hospitals had explicit free care policies, and (3) whether hospital administrative staff were respectful in their treatment of individuals requesting information about free care. The survey also served as an indicator of the hospitals' compliance with the Department of Health regulations and as a measure of hospital commitment to the District's medically underserved population. Two telephone inquiries were made to each hospital's general information number by researchers identifying themselves as being uninsured and asking whether the hospital provided free care and, if so, what its policy was for making it available. Two telephone inquiries were made to each hospital's finance or billing department by researchers identifying themselves as social service agency workers asking whether the hospital provided free care and, if so, what its policy was for making it available. A site visit was made to each hospital to document whether there were signs indicating the availability of free care. With respect to the telephone calls by researchers who represented themselves as uninsured, some spoke Spanish when they made their inquiries. To ensure uniformity of approach, the researchers used a telephone protocol and a site visit protocol. Researchers then recorded the results of their telephone conversations and site visits. At most of the hospitals, staff at the general information telephone number did not know whom to refer the researcher to for information on free care. At most of the hospitals, staff in the finance or billing department either didn't know whether there was a free care policy, or they stated that free care was not available. On several occasions, researchers were told to go to D.C. General Hospital if they needed free care. On several occasions, researchers were told that the hospital in question was "private" and therefore it did not have to provide free care. On several occasions, researchers speaking Spanish found that no one was immediately available to answer their questions about free care. Of the ten hospitals surveyed, only one indicated that there was a written policy regarding free care, and only three were able to provide researchers with free care applications. Even when researchers were transferred to the hospital finance or billing department, staff were generally unclear as to whether there was a free care policy, written or unwritten. In every case, hospital staff indicated that services would be provided in an emergency, however researchers were told by all hospitals except one that they would be billed for the emergency services. In all but one case, hospital staff members were very respectful and helpful to researchers, trying to assist them by referring them to other places where free or low cost care might be available. With one exception, hospital staff indicated free care is available. Hospital has a written free care policy and provided a free care application. Signs publicizing the availability of free care are posted in admitting, emergency room, and billing department. All researchers were told that the hospital provides no free care services except for emergency screening and stabilization. Hospital staff consistently told researchers to go to D.C. General for free care. While it appears that Spanish interpreters are available, researchers had to wait at least fifteen minutes to be connected to an interpreter. There was no visible signage publicizing the availability of free care. The switchboard operator referred the researcher to a community clinic which, when contacted, indicated that it did not provide free care. The hospital did have required signage in one location. In all instances researchers were informed that the hospital provided no free care services. Researchers were told to go to D.C. General for free care. Hospital postings speak about non-discrimination and denial of care in general terms, but they do not contain the required statement that free care is available. A researcher who identified herself as being from a social service agency made several calls and left messages w/ Customer Service and Case Management offices asking for return calls, but never heard from anyone. 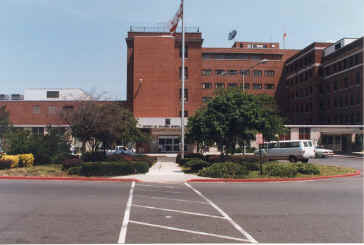 In all cases, researchers were told that Washington Hospital Center does not provide free care. In most cases researchers were told to go to D.C. General or Howard University Hospital for free care. Researchers were told that no free care was available. One staff person referred the researcher to "Family Practice." When the researcher called that number, he was told that no free care is available. When information was requested, the researcher was referred to the marketing, admitting and patient relations departments, finally to be told that there is no free care. Staff information was inconsistent. Receptionist said free care was available, but another staff person said that there was no free care and the researcher would be billed for it. Another staff person told the researcher that free care was available, but "you have to know about it to ask for it ...."
Hospital did have a free care application that it provided to researcher. In all instances, researchers were told that free care was not available. Researchers were bounced around from department to department. This was the only institution where the switchboard operator was extremely rude to the caller. One staff member indicated that researchers could receive free care at D.C. General. Another staff member said that the hospital has a medical charity program, but that there was no written policy. The hospital has a free care application that it provided to the researcher. Providence had the ability to communicate with Spanish speaking researchers, although there was a short wait. Uninsured researchers were informed that the hospital does not provide free care services. Social service agency researchers were given conflicting information. In one instance the researcher was told that free care is available and that there is a written policy. In another, the researcher was told that free care services are not available. There was no visible signage publicizing the availability of free care, however a posted code of ethics references the Hospital's commitment to fair and accurate billing. The focus of this survey was whether hospitals were making information about free care readily available, as they are required to do. The survey findings indicate that in the overwhelming majority of cases, they are not. Difficulty in obtaining basic, reliable information on the availability of free care is the rule rather than the exception among D.C.'s hospitals. Even in those facilities that appear to have established mechanisms for the provision of free care such as applications and free care policies, front line staff is not always familiar with institutional policies. This pervasive lack of compliance with both the letter and the spirit of the free care notice requirements raises a serious question as to whether most hospitals are in compliance with other regulatory requirements, including the threshold one that they provide uncompensated services. 1) Support enforcement of existing laws. Based on our survey, it does not appear that the District's hospitals are in compliance with the notification requirements of existing regulations. This raises concerns that they are also not in compliance with other requirements related to free care. At a minimum, the Mayor and City Council should direct the Department of Health to undertake the necessary audit and compliance activities to ensure that free care is available. 2) Strengthen CON requirements and DOH monitoring. Currently, applicants for CONs are required to maintain their uncompensated care commitment at the same level for five years after the issuance of the CON. At a minimum, the Mayor and City Council should amend the definition of free care so that it explicitly excludes bad debt. They should also require the SHPDA to file an annual report on the results of its compliance monitoring. 3) Condition receipt of supplemental Medicaid funds on adoption of certain free care policies and on free care performance. The administration has a fair amount of latitude in the distribution of Medicaid "disproportionate share hospital" ("DSH") funds and enhanced Medicaid payments. It should condition receipt of those funds by hospitals on their adoption of free care policies that provide full free care for individuals with incomes up to 200% of federal poverty levels, and partial free care for individuals with incomes between 200-400% of poverty. Clarify the definition of uncompensated -services to specifically exclude bad debt. Bad debt is a routine cost of doing business for any enterprise. Hospitals should not be permitted to fulfill their obligation by counting bad debt toward their free care obligation. Standardize eligibility for free care by providing for full free care for individuals up to 200% of the federal poverty level, and partial free care for individuals with incomes between 200-400% of poverty. Reorganize and formalize the provision of free care by establishing a free care pool for hospitals and safety net clinics, which would be funded through surcharges on hospitals and health plans. Pool payments would be calibrated depending on the proportion of uninsured individuals and Medicaid recipients served by the hospital or clinic. 1) Aggressively enforce existing regulations. The Department has ample enforcement authority in its regulations to address noncompliance, but based on information produced by the SHPDA, it is not even using that authority to collect the data necessary to make compliance determinations. At a minimum it should require hospitals to file their audited financials and related notes. Only in this way can it make an accurate determination and initiate compliance proceedings where appropriate. 2) Support passage of proposed new legislation. Work closely with the Mayor and City Council on passage of legislation that would improve access to free care as described above. 3) Support targeted DSH and enhanced Medicaid funding. Work with Mayor and City Council to ensure allocation of extra funding to hospitals with enhanced free care income requirements. Work with hospitals to improve and expand their free care policies. 2) Reach out to local communities. Work with local communities to craft stronger free care policies that address the community's needs. 3) Support passage of proposed new legislation. Work with all interested parties to pass legislation that would improve access to free care as described above. 1) Establish a relationship with the local hospital. The community should work closely with their hospitals to craft new policies that are responsive to the needs of the community. 2) Support passage of proposed new legislation. Work with all interested parties to pass legislation that would improve access to free care as described above. 3) Undertake public education. Publicize the availability of free care, and monitor and report on hospital performance with regard to free care. 4) Play an active role in increasing access to care and institutional responsiveness. Support increased primary care access and the provision of community benefits by local health care institutions. 1. The notion of a corporate social obligation is not unprecedented. Banks are explicitly required to make basic checking services available to all communities and to reinvest assets into the communities they serve. Utility companies are required to service all geographic areas, including "unprofitable" rural regions. Health insurance companies, both for profit and non-profit are generally expected to offer coverage to all businesses regardless of individual health status, to limit the use of pre-existing condition exclusions, and to assure continuity of coverage for people in transition. 2. Rhode Island General law §23-17-41 establishes a standard for provision of free care that applies to all hospitals. Massachusetts General Law Chapter 1186 which governs payment of hospital uncompensated care and eligibility for free care applies to all acute care hospitals in the state. Chapter 70.170 of the Revised Code of Washington requires all hospitals to provide free care to certain income-eligible individuals. 3. The agency within the Department of Health that has responsibility for administering the uncompensated services requirements is the State Health Planning and Development Agency ("SHPDA"). 4. Hospitals are required to obtain CONS whenever they offer or develop a new service, whenever they make a significant capital expenditure, and whenever there is a change in ownership or control. Once a hospital obtains a CON, it is considered to be a CON 'holder' even after the new service is offered and developed, or the capital expenditure made. Since most, if not all, hospitals in the District of Columbia have obtained CONs at some point or other, we have assumed for purposes of this survey that the regulations of the Department of Health are applicable to all hospitals in the survey. 7. This matter involved the application for a certificate of need to construct a new facility for the George Washington University Hospital. Findings of Fact and Conclusions of Law, Inn Use Matter of District Hospital Partners. LP., Certificate of Need Registration No. 98-2-2, District of Columbia State Health Planning and Development Agency, December 21,1998. 8. Hospitals must provide full free care to individuals up to 100% of poverty, but they may use a sliding fee scale for individuals between 100-200% of poverty. CDCR 22-44-4406.